Nebo Daniel passed away on the 10th May 2005, a true legend of the breed dominating the show ring and sire ratings for nearly three decades. Throughout his fantastic life he brought utmost pleasure to us at Nebo and judging by all the letters, emails and telephone calls we kindly received from his fans following his death, it made us realise the special regard in which Daniel was held by breeders and enthusianst worldwide. As a young foal we knew he was rather special, he spend hours trotting round the field in great style and never worried for his mother's attention. Daniel started his showing career with success and as we predicted he never looked back. 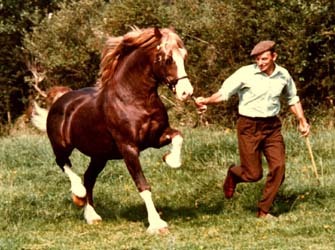 His bright chestnut colour (that later turned liver chestnut), flaxen mane and tail, four white sock, tremendous action and 'look at me' presence took everybody's eye from his first appearance in the showring until his last when he received his usual loud applause at the Ceredigion Centenary display at the age of 24. Daniel was shown around England and Wales winning at most of the County shows, but we will only mention a few of Daniel's favourite shows and greatest achievements. In 1988 he won the coveted George Prince of Wales trophy at the Royal Welsh, he was also male champion and reserve overall in 1986 and 1989. In 1987 he was supreme champion at the Three Counties, Malvern and represented the show for the Lloyds Bank In Hand Championship at the Horse of the Year Show. 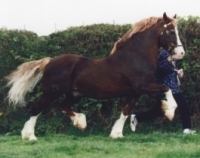 He dominated the Mid Wales Stallion Class at Lampeter Stallion Show from when he won the Robleigh Cup for the best 3-year-old until 1990 where he was Welsh Cob Champion and Supreme of the Show on the day he retired from the showring. He loved every moment of the huge applause he received during his final lap of honour and what could have been more appropriate than on his homeground in the Cardiganshire's premier stallion show. It was to everybody's relief at home that we decided to retire him from the showring as he was such a nervous traveller and got so worked up before the class. Once he arrived at the showring he excelled in every way and never let us down. Showring success was only half the story as he was also a fantastic stockgetter producing mares and stallions of the greatest caliber. His notable progeny include: Nebo Prince, Nebo Rachel, Tewgoed Mari (dam of Nebo Hywel, Nebo Joni Jones, Nebo Rosemary, Nebo Julie Ann), Tewgoed Janet (dam of Nebo Thomas and Nebo Owen), Tynybryn Miss Poppedyn, Northleach Daniel, Northleach Danielle, Menai Sparkling Lady, Ring Danielle, Rhydfendigaid Daniel, Leyeswick Daniel, Pantanamlwg Free Gift, Neuaddparc Welsh Maid, Nebo Calonog, Ilar Sion ap Daniel, Tawelfan Reflection, Fochnant Lilian, Rhystyd Express and Tyngwndwn Daniel. Daniel was a Welsh Cob of a lifetime. We have so many memories of the wonderful years we shared with him and feel priviledge to have bred and owned such a fabulous horse.